When I first came to Japan, I knew very little about Japanese football and could find out even less information about it. The games I went to in my early days living in Japan were usually thanks to a kind Japanese friend who shared my passion for football and would sort out all the arrangements for me. If you don't speak Japanese fluently and can't read the language either, it can often be very difficult to keep in touch with what's happening in the J League and to find decent match day information. Especially for tourists coming to Japan and hoping to take in a game on foreign soil. Furthermore, I got very little information about what was happening in the J League, about the players, managers and the teams and all the usual highly charged and enjoyable debate about football you find in England every day of the week. This is starting to change. With the advent of the internet and social media there are now far more ways to keep in touch with Japanese football, to debate the issues and to find help to get tickets and go along and support your local J League team. Your first stop on the internet should be JSoccer.com - a website about all things on Japanese football. It is also a very good magazine which has been published 3 times so far and a new issue should be coming soon in early May and will be available at all the usual outlets, and also for overseas readers. You can get interesting articles, match previews and reports and much more besides. Podcasts in football have become very popular over the last few years with football fans all around the world. James Richardson's football podcast on the Guardian has been particularly praised and has garnered a loyal and large following. I know of two podcasts in English which cover the J league and both are well worth a listen, and appear regularly on Mondays during the season. The J-Talk podcast is presented by Ben Maxwell, an Australian sports-mad guy who loves his football. He is a fan of Liverpool FC and more relevantly an FC Tokyo fan. In fact he has a blog on FC Tokyo, so if you are interested in FC Tokyo or finding more out about the Capital's J1 team, you should check it out. The show has only started recently and I have listened to all the episodes so far. It's a great addition to the Japan football scene. The format so far is Ben with one invited guest and they discuss the previous week's football in the J league, the Asian Champions League and any Japan national team news, followed by a look at the next week's fixtures. Players, coaches and team performances are assessed and criticized and I feel as a listener are dealt with fairly and honestly without too much undue bias. 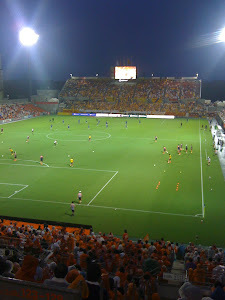 It gives me an update on how Omiya's rivals are playing, and information on players to look out for. It's fun and engaging and so far the guests have been value for money. Ben has talked to a mixture of journalists based in Japan, or guys who are huge fans of certain teams and are often involved in running blogs or websites on those teams. From the journalists you tend to get an overview of the whole league from a rather neutral standpoint, whilst from the fans you get a look at that same league but from a far more passionate perspective. Both work. The second podcast I know of, which concentrates on the J League is presented by a journalist called Ben Mabley and is called The Football Japan Minutecast. Interestingly enough, it usually lasts longer than a minute. Most of the shows I've listened to, seem to be about 5 or 6 minutes but one I heard was a much longer discussion. The regular Minutecast appears on Mondays and is a round up of that weekend's fixtures with any key talking points also highlighted. The listener gets all the relevant info in a timely manner, so it's perfect for people who are busy on Mondays and who just want to get the salient points of what happened in the J League over the weekend, and then perhaps they will delve into the details at a later date. Or at least that's how it works for me, and in that sense I find it useful. Ben also publishes the text of his podcast. To be honest, I'm not sure of the purpose behind the Minutecast, but as I said I get some value out of it. The longer discussion I mentioned earlier, came after the Osaka derby between Cerezo and Gamba and was a roundtable between Ben and two other journalists discussing the match and everything surrounding it. I found that show very informative and entertaining, and I hope that at some stage more episodes like that are produced. Ben also has a website which I have glanced at too and seems to be all about football in Japan. He is based in Osaka and is a Gamba Osaka fan, but writes very well on all Japanese football, and I'm sure if you are looking to find more out about Japanese football, then you might do very well to give his website a look too. Here are some details about the websites I mentioned above. Anyway, if you don't know much about Japanese football and want to know more. Or if you are already a fan but just want to get more involved, then give these guys a try as a starter. There are more guys out there writing about Japanese football in English and I will review them at a later date.